During the last decade the European Union had started elaborating the transition from a linear to a more circular economy. In particular, the European Commission presented a new circular economy package on 2 December 2015. The package contains an action plan in order to promote circular economy. It also maps a series of actions planned for the coming years and four legislative proposals on waste setting targets for landfill, reuse and recycling to be met by 2030. To achieve these goals it is necessary for companies to follow the examples of good practices that can indicate concrete ways of applying the Circular Economy. 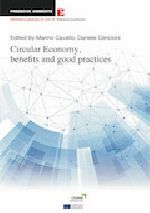 The heart of this volume is what are the advantages of adopting the Circular Economy for Business and some significant good practices as well as explaining who are the actors in the field that can work to achieve European goals. This volume is based on the experience of the Metropolitan City of Bologna in the European CESME project on the Circular Economy for small and medium-sized businesses (SME) and the collaboration between the Metropolitan City of Bologna with the Department of Economics of the University of Bologna. Marino Cavallo is Head of the Research, Innovation and Management of European Projects at Metropolitan City of Bologna. Daniele Cencioni is Communication Manager at Metropolitan City of Bologna.